Just reduced! This cream puff just got even more attractive! Freshly painted inside and out, brick front Amhearst model with curb appeal galore! Fabulous landscaping, EP Henry hardscaping, custom exterior lighting. Enter into this 2 story spacious light-filled foyer featuring large chandelier, palladium windows, hardwood flooring and moldings. The living room features a mantle wood burning fireplace, triple palladium windows, and moldings. The dining room is straight ahead welcoming one to come and celebrate a special event in this lovely room with a wall of glass, featuring hardwood floors and custom moldings. 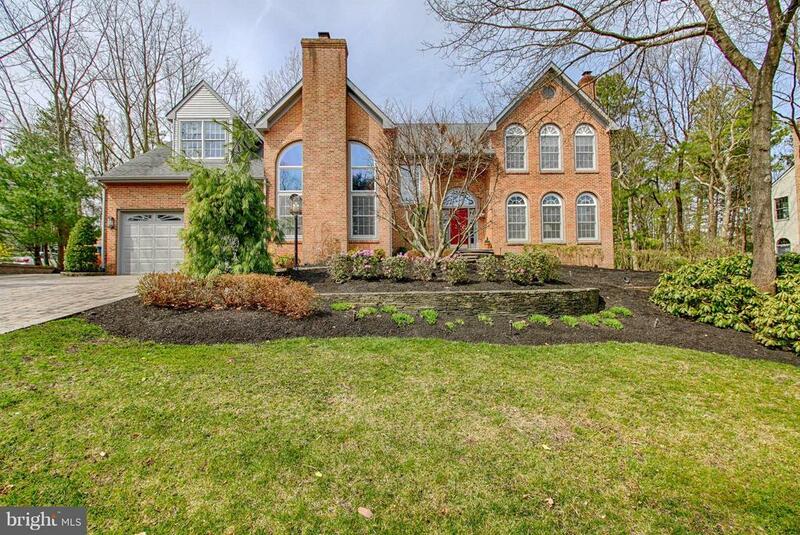 There is a full bath and a 5th bedroom or office right off of the foyer, quietly tucked into the corner of the home. The center of the home is the large gourmet kitchen featuring custom cherry cabinetry, top of the line appliance package, large kitchen island , granite counters, custom lighting package, a walk in pantry, desk area and breakfast room. The rear wall of kitchen features custom Andersen patio doors and windows with transoms matching the cherry cabinetry, so beautifully done! The family room is a step down from the kitchen featuring soaring ceilings, brick fireplace and a juliet balcony. A first floor laundry room is located off of the kitchen along with another half bath. Upstairs find a grand master bedroom suite featuring a large updated bathroom with heated floors, towel warmers, , extra large custom shower with 3 shower heads and soaking tub. double vanity with custom mirror and light package and large linen closet. New custom walk in closet with built in shelving, drawers, and closet racks. A long hallway leads one to the other 3 bedrooms and an updated bath. In the lower level, there s a huge great room, featuring high ceilings, new carpeting, a lighting package, and new wet bar a dual wine coolers , and granite counters and tile backsplash. There s plenty of room for a fitness area . Large storage area contains an updated 2 zone high efficiency HVAC system(2009)., 2 on demand tankless hot water heaters(2015), updated and expanded electrical panel(2010). And before you leave this home go ahead and stroll l outside to check out the spectacular hardscaped patio featuring an outdoor kitchen with built in grill, refrigerator, and granite counters. Enjoy the perennial gardens and meandering paver walkways and dont miss the large hot tub for those cool evenings . No expense was spared on the finishes of this well designed home. Come and enjoy your tour of this lovely home. Directions: Route 73 to Cooper Road to entry of Sturbridge Woods, Turn onto Forrest Hills Drive, bear left again at fork of road, onto Forrest Hills Drive.